The night before the race I was scared of and worried about many things…a disappointing finish time, worried I hadn’t ate enough that day or that I didn’t have the right thing to eat on the morning of, I was worried about getting enough sleep and just generally nervous that I had forgotten something important. Do I have my running kit? Running shoes, a weather appropriate outfit and a hair tie? Do I have a race belt or safety pins for my bib? Have I bought my nutrition for during the race? (I like Cliff Shot Bloks). Am I drinking water right now? No? Get a glass! When is the start time and how am I going to get to the race? Set a million alarms to make sure getting up on time isn’t a worry. Do I have these things? Yes – than logistics are sorted. Everything else is out of my control and therefore not worth worrying over. Except this time I had a strange breakfast (I bought a yogurt parfait at an underground stop convenient store shop which I didn’t know if I could trust but all other shops had already closed up), a broken hair tie and no safety pins/ race belt for my bib. I could feel some of the negative jitters come on but I just made note of what was missing and figured they are all resolvable in the morning. Right, I’ve ate the strange breakfast – it was alright. I mended my hair tie – not the first time this has happened. And I salvaged two safety pins for my bib. Now, I’m at the start line – I’m about to race – and here come the jitters in full force!! This is when you really focus on not entertaining your negative thoughts… they’ll come through your mind constantly but just watch them leave again without being effected, considering or debating them. 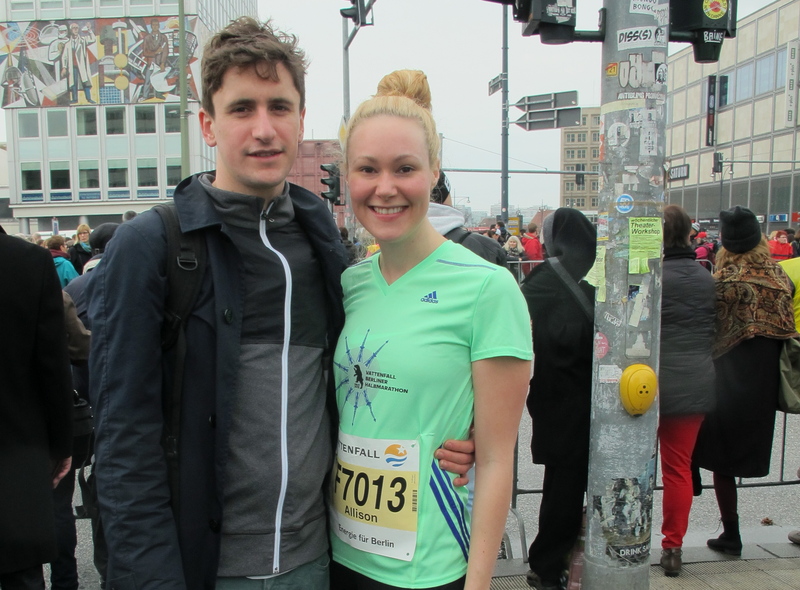 One thing I have to say about the Berlin Half Marathon was how amazing the atmosphere was. You know your at a good event when the atmosphere at the starting line is bursting with good vibes. This helps a lot when you’re trying to ignore those negative thoughts. A good running race should feel like a massive street party – This is exactly what the Berlin Half Marathon atmosphere was like. I got so excited when we were all lined up at the start — the music was blaring, German announcers where pumping up the crowd and simply knowing that there were 30,000 people just as nervous as me or as the next person about to race, created some serious energy. To be fair, I got arguably too excited when first immersed with this atmosphere — my start wave didn’t release until 20 minutes after I thought it would. Getting too excited too early can be draining so to a point, I needed to rein it in a bit!! For me the final thing that eases my nervs is having Dan at the race supporting me.